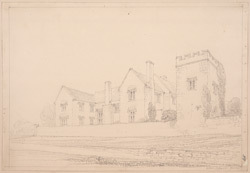 This pencil drawing is of the exterior of Weare Giffard Hall, showing the battlemented gatehouse to the right. Weare Giffard was home to the Fortescue family from 1454, when the Weare heiress Elizabeth Denzil married the second son of Sir John Fortescue. Although the exterior of the house has fine carving, the interior boasts many remarkable features. The main hall is itself outstanding. Its hammerbeam roof is divided into four bays and is decorated with seated greyhounds and dragons, symbolic of Henry VII. The rest of the house boasts fine Elizabethan panelling, ornate plasterwork and Jacobean fireplaces.The site fell into neglect during the 17th century and was later restored in 1832 by George Matthew Fortescue.